One of the last issues kept happening due to the linux package made only for 64 bit architectures, which is stated nowhere and not checked during installation. So slicing cannot run when your PC is running a 32 bit linux OS. The easiest fix is to rebuild the slicer, which is a piece of cake compared to 3D printing! Update (jan, 2014): full instructions on how to build Cura from scratch (see the last chapter). Note that the remaining interactive part of the application is fully functional though, because it is written in portable and machine-agnostic Python. The slicer needs C++, which also explains why it is much faster than the old and terrific skeinforge slicer. Skip to the last chapter of this post if you want to compile the whole Cura latest project instead. Still, it is relatively easy to fix the issue, by downloading and installing the "deb" package as usual, then compiling the slicing engine on your platform and for your platform, and use the resulting executable instead of the provided one. Install the default package (mostly python Cura GUI). You probably have done it, else you can check the lastest build from Ultimaker website (the kind sponsor behind opensource Cura). If you would better also go with the latest Cura GUI, check the last chapter below! Now we will rebuild SteamEngine, which is Cura's very capable and fast slicer. Building may complain about missing development libraries, in which case you will have to install them with apt-get (eg. build-essential and some other *-dev libraries, look for them using google). If you do not have git on your system, you can get a zip file of the project by using the button in the right margin on github. You should now be OK to run Cura entirely. Only if you really want the latest versions of Cura and the slicer, e.g. when the prepackaged Cura gets "too" old for the new features you really need to try, then you can download the zipped source directly from the developer github account. Note that this now comes bundled with SteamEngine (aka CuraEngine), so you won't need to compile it specifically, as described above. Be well aware though that the latest build may be unstable ! Back into Cura git folder. Compile the engine: I got some errors but they were not blocking for now. If or when they get critical, I would compile CuraEngine separately like in the previous chapter. 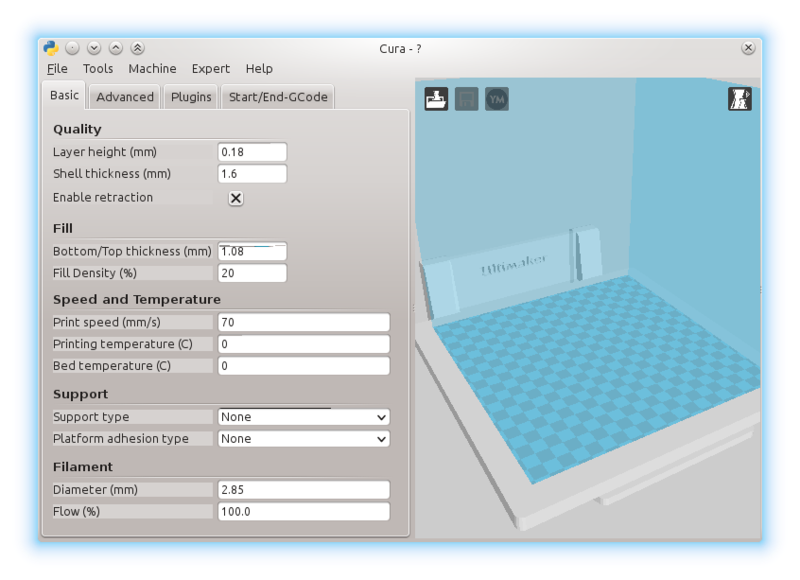 On its side, the Cura GUI is pure Python so it may run straight out of the box. Now, whenever you want to update your build, just go to Cura folder, do a git pull then ./package.sh and you should be ok (as for Jan, 2014).